Established in 2008, NRM North’s Tamar Estuary and Esk Rivers (TEER) Program is a regional partnership between the statutory agencies responsible for waterway management within the Tamar Estuary and Esk River catchments. The TEER area covers approximately 15% of Tasmania and includes the Tamar, North Esk, South Esk, Macquarie, Brumby-Lake and Meander catchments. In 2014, the TEER Program secured funding to undertake catchment management activities through the Tamar River and Recovery Plan and the Australian Government’s National Landcare Programme. Through this Plan and funding source, NRM North implemented a Riverbank Erosion Grant program in association with landholder and land managers across the TEER catchment area. Jesse Webster the Water Coordinator for NRM North said the key objective of the Riverbank Erosion Grants program is to reduce sediment loads, nutrients and other pollutants from entering the Tamar estuary through the management of waterway and floodplain erosion. “Riverbank erosion has the potential to generate high loads of sediment in waterways, particularly during floods. In the past, community groups and landholders have struggled to tackle these issues due to the cost involved and the technical nature of stabilising riverbanks” said Mr Webster. The program provided grant funding of up to $25,000 to community groups, industry groups, local government and individual land managers within the TEER catchment area. 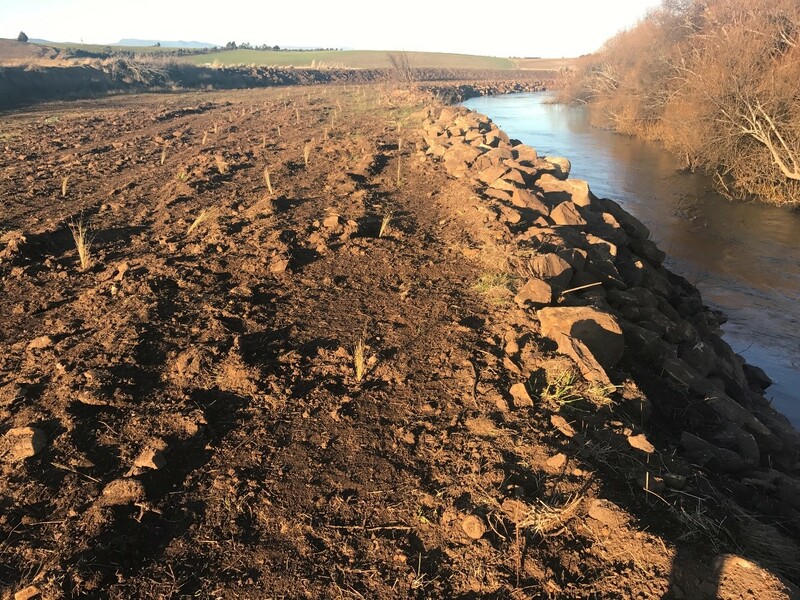 Funds were available for a range of activities including riverbank stabilisation works, riparian revegetating, fencing out stock, installation of off stream water and creation of localised wetland areas to minimise sediment delivery to waterways”. The program which ran over 2 years has had 22 successful applicants with a total of $406k allocated to on-ground works and $467k of in-kind contribution towards the program. The works will prevent an estimated 963 m3/ year of sediment from entering the waterways and potentially ending up in the Tamar River Estuary. The program also incorporated over 12km of new stock proof fencing, planting 13,650 stems across 22 hectares of riparian revegetation as well as placing close to 20,000 tons of rock and timber to prevent further erosion. Water infrastructure was also incorporated into the program providing off stream stock access to water which saw the installation of 12 new water troughs and over 5km of poly pipe. Julian Martin a River Engineer/Geomorphologist from Water Technology was engaged to deliver initial advice during the application process as well as providing site visits and design reports for each successful project. Julian said the program created great community awareness around the impacts on the estuary. “The Riverbank Erosion Grant program is a collaborative approach to reduce sediment inputs to the Tammar Estuary. The program not only provides financial and technical support for landholders to manage and be responsible for their stretch of river frontage but also works to build community awareness about the impact of land management practices and sediment on river and estuary health” said Mr Martin. Mr Wing was successful in receiving funding to manage a bank erosion site on the Lower Macquarie River, a tributary of the South Esk River. The site exists as a heavily eroded vertical bank on an outside bend approximately 130 m long. 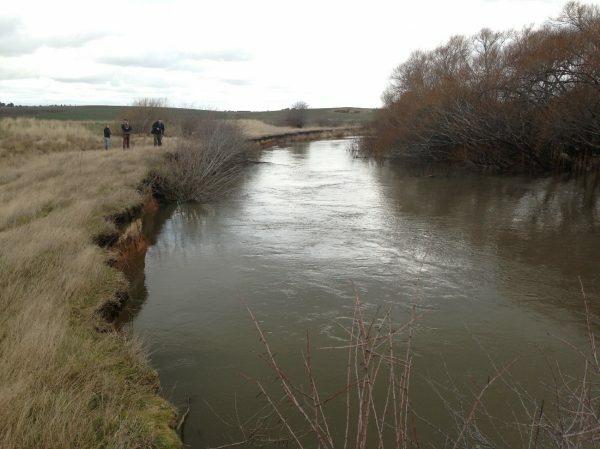 The bank made up of various sediment layers including canola clay, which is very friable, particularly impacted by repeated rapid draw down cycles from the Poatina Power Station operated by Hydro Tasmania. A majority of the site is devoid of riparian vegetation except for occasional small Willow, Briar Rose, Blackberry and Hawthorn. The bank height ranged from 4-5m and a levee exists approximately 25m back from the top of bank. Eroded Bank Section Prior to works. In-channel willows are present adjacent the eroding river bank. These willows may have initially contributed to the erosion at this site, however future erosion is likely to occur independently of the willows. Stock access had been previously identified as contributing factor to erosion at the site, however stock have been excluded from the site for some time. Works at the site included battering of the bank and relocation of top soil as well as the placement of over 2000t of rock beaching sourced from the property. The Green Army was involved in riparian plantings of 2000 stems along 150m of riverbank as well as along the flood levee. No fencing was required at this site as stock do not have access to the paddock. Ongoing planting will happen over years to come to increase the diversity of the riparian zone and increase the resilience of the area to frequent flood events. 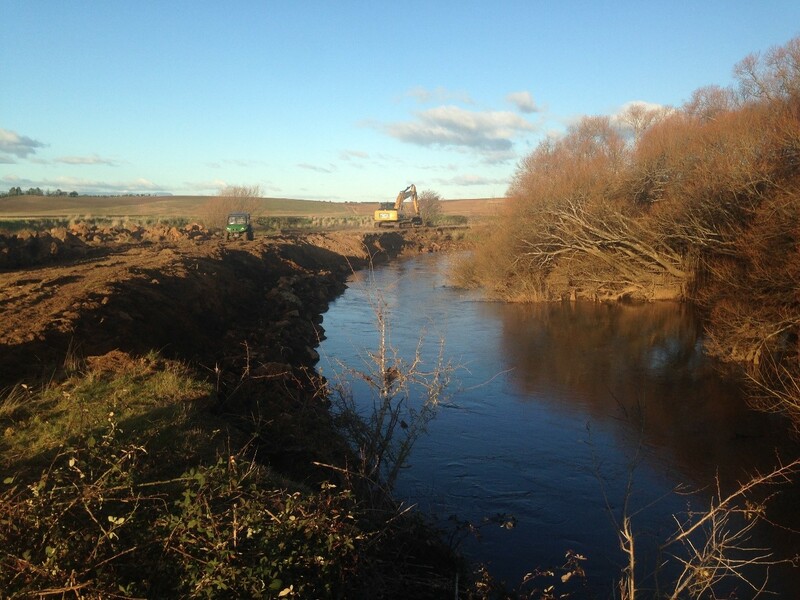 The Riverbank Erosion program being oversubscribed in both years has fulfilled a large requirement across northern Tasmania by providing technical advice and support to landholders who would have otherwise had no access. There have been significant benefits throughout the TEER catchment with a large reduction in riverbank erosion reducing the downstream migration of sediment into the Tamar Estuary.